Approximately 84 percent of homes have some form of air conditioning ranging from simple window units to high-tech outdoor A/C units. Central A/C units are the most popular and consist of an outdoor compressor/condenser that is connected to your furnace. With a central air system, cool air is pumped through the existing ductwork in your house. Hidden Design – With the exception of the outdoor condenser, a central air conditioner is pretty invisible. Inside your home, a central system relies on your furnace and existing ductwork. All of these components are seamless and are barely noticeable, which means the A/C system won’t interfere with your interior design. Ease of Control – You can control your central air conditioning system with one thermostat, which makes it very convenient. Simply set it and forget it. Installation Cost – According to the U.S. Department of Energy, it costs 30 percent less to install a central air system than it does to install a ductless one, which makes it an attractive option budget wise. As with all things, there are some cons of installing a central A/C unit. The main downfall involves its need for ductwork. For a central air system to work, you must install ducts. Ducts do take up a certain amount of space and may affect your building plans. Furthermore, installing ductwork is a complicated, expensive process. Installing ducts may not be an option in an older home that doesn’t have existing air ducts. 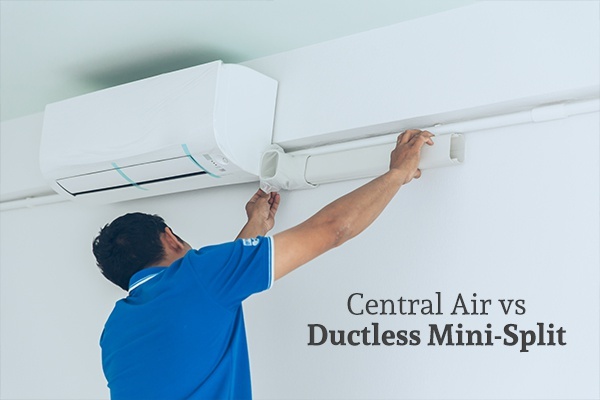 While central air has dominated the market place for quite some time, ductless mini-split systems are becoming increasingly popular. Consisting of a small outdoor condenser/compressor that connects to up to eight indoor units, a ductless system allows you to control the temperature in each room or zone. Indoor units are placed on the walls in strategic locations. Easy Installation – Since they don’t require ductwork, ductless systems are easy to install. Each indoor unit is connected to the outdoor compressor via a small refrigerant line, much like the natural gas lines in your home. Efficiency – Over time, you can expect to save more money with a ductless system than a central system. Zone Temperature Control – A ductless system allows you to independently control the temperature of each zone in your home. This means that you can turn off the A/C in areas of the home that get little use, thus improving energy efficiency. Upfront Cost – Ductless systems are more expensive to install than traditional central A/C units; however, they do pose cost savings over the long run. Visual Impact – The wall units necessary to make a ductless system work are very noticeable. In order to circumvent this problem, some manufacturers are making their cooling units look like paintings or works of art. Which system is right for you depends primarily on your needs and budget. If you don’t have existing ductwork, a ductless system will be easier to install. If you already have ductwork and a tight budget, a central unit may be your best choice. You should also consider whether you want to be able to independently control the temperature in each of your rooms. For more information or to schedule a consultation, contact Cote’s Mechanical Heating & Air Conditioning.